It may come as a surprise to many that Alfie Solomons from the British tv series Peaky Blinders is based on a real life early 20th Century Jewish gangster from London. Note: The additional "s" at the end of his name on the show is fictional. Scant information is known about him, but we do know some things . . .
Solomon partnered with London Italian gangster Darby Sabini (also portrayed in Peaky Blinders), to control the North London rackets along with the race track activity of the day. Solomon along with his brother Harry provided protection for Jewish bookmakers at the track where the brothers became both "famed and feared." At a certain point, the gang came into contact with rivals from Birmingham and came to blows at the Bath race course (known as the Battle of the Baths). Harry was arrested for pulling a gun on a policeman. In 1921 Solomon stood charge for attempting to murder Billy Kimber (another Peaky Blinders character) outside Sabini's apartment, but he was acquitted, as all the witnesses "lost their memory." In 1924, Solomon was again charged with the murder of one Buck Enden, a bookie, along with the attempted murder of Michael Abelson the doorman of the Eden Social Club. It seems the Solomon brothers had demanded payment of racing bets, which led to a quarrel leading to the "free fight." Ultimately Enden was stabbed in the street, dying before he reached the hospital. Although details are vague, according to a letter Solomon wrote in 1930, (in which he offered his services as a police informant and asked for protection from a group of men who he believed were looking to kill him), he had been convicted at the Old Bailey of the murder of Enden and acquitted of the charge of grievous bodily harm against Abelson. He went on to serve a 3 year sentence of "penal servitude" for the crime. In the same letter, Solomon claims that, "Since being released I have got a respectable livelihood on the racecourses betting and never been in trouble since and do not want to get into any." 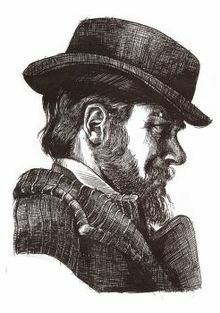 From there the record goes cold, that is, until Tom Hardy showed up as the character of "Alfie Solomons" in Peaky Blinders. Meyer, Daniel. "Alfie Solomon - London Gangster ." J-Grit: The Internet Index of Tough Jews. J-Grit.com. Apr. 2019 <http://www.j-grit.com>. The History Girls - http://the-history-girls.blogspot.com/2016/05/peaky-blinders-fact-or-fiction-by.html | Peaky Blinders: Fact or Fiction?